Guide books to modeling are a problem of sorts, as they have to stake out a section of turf and then define it. The bugaboo is that just as you have described one series or class of kits, new ones come out that supplant or replace the current entries, thus limiting the value of the book as a whole. Happily, with the continuing line of good works from well-known armor modeler Steve Zaloga, this is rarely a problem, as about 95% of the techniques he shares and discusses are of use to any armor model, and many of them are even "cross-discipline" and pertain to other modeling genres as well (aircraft, ships, cars, figures, sci-fi, and especially model railroading). 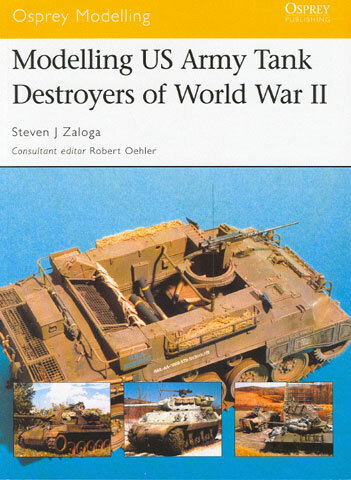 This book focuses on WWII US tank destroyers, a colorful and interesting class of ultimately flawed vehicles and guns. When tanks came about in WWI, nobody thought much about them as reliability was so low. But in the 1930s, when tanks began to emerge as a new threat on the battlefield, there was a bit of reactionary aversion to them by the "traditional"
combat arms: infantry, artillery, cavalry. In the US Army, as a result there was a rise of the tank destroyer, either a gun or lightly armed, highly mobile vehicle that could kill tanks before they could cause great destruction. Based on forced modeling – and a heavy dose of branch biases by the aforementioned three branches – tank destroyers were "demonstrably superior" to tanks during the 1941 Louisiana Maneuvers. As such, they were adopted for the US Army and battalions were created in short order. The reality was that what the Army wound up with was either weak or ineffective towed weapons or tank-like vehicles that could not really battle other tanks. After high losses and much sacrifice during the war, the tank destroyer concept was quietly dropped after the war was over. From a modeling standpoint, however, it created some neat-looking vehicles that are fun to model, as they have open tops and busy interiors. Steve turns his attention in this book to four basic subjects: a 1/35 scale M36 90mm GMC in a winter camouflage, based on the new Academy kit; a 1/72 Extratech kit of the M10 3" GMC; a 1/35 scale model of the M18 Hellcat based on the AFV Club kit; and a 1/35 conversion of the same AFV Club M18 into the M39 Armored Utility Vehicle for towing the M5 3" Antitank gun. But in passing, Steve also comments on most of the available kits of tank destroyers, and provides inside into the Dodge-based M6 37mm GMC, the halftrack mounted M3 75mm GMC, and the M36B1 90mm GMC on the M4A3 chassis. Unlike some of the other Osprey authors – or many other modeling authors in general – Steve is able to show clear, concise photos and text of what he does and how he does it. He explains his techniques, shows how it is done (and the interim steps of what the effect or part looks like in transition) and also the finished result. Too many "authors" seem more intent on bragging about their achievements and showing only a finished effort, usually badly. The editors of such publications should use books like this one as their reference standard of "how to do it" to ensure a better product. Overall this is an excellent book for the money, and even if you do not build armor, you can find many, many useful tips and hints within its covers.